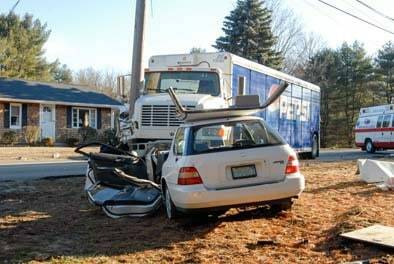 If you have been injured or lost a loved one in a Massachusetts truck accident, we urge you to find a trial lawyer with real truck crash case experience. We are that firm. For 25 years, our lawyers have successfully represented truck accident victims in all kinds of cases. Our results speak for themselves. We have several multi-million dollar truck crash recoveries, which are described below. Our satisfied clients will tell you that they have witnessed the high quality of our representation and they trust us unconditionally. Truck accident cases are among the most challenging personal injury cases we handle. They usually involve life-changing injuries. When victims and their families come to us, they often don’t know how to put the pieces back together. The trucking company refuses to admit fault. The insurance company turns a blind eye. Lives are turned upside-down. As the bills pile up, it becomes clear that no one is on the victim’s side. That is where we, as Boston truck accident lawyers, come in. We become your advocates in your legal case. We retain the best trucking and medical experts in the land to support your claim. We aggressively investigate every aspect of the crash. We determine which entities are responsible and we advocate for your cause. We are unafraid to file suit and litigate to verdict, particularly with hard- nosed insurance companies that deny credible claims. We welcome the challenges of a complex trucking accident case, which is why our clients review us so favorably. Our accident lawyers are among the most respected trucking and transportation lawyers in New England. Established in 1992, Breakstone, White & Gluck, P.C. is a personal injury law firm based in Boston, MA. Our firm’s attorneys have handled many truck accident cases, including lawsuits against some of the largest trucking companies, distributors, and insurers in the nation. We handle cases throughout Massachusetts and neighboring states. Our trial-tested lawyers don’t back down when a difficult claim is denied. We welcome the opportunity to litigate to verdict to get our clients what they deserve; full and fair compensation for life-altering injuries. We encourage you to give us a call. Your initial consultation is completely free. You will not pay any legal fees or costs unless we help you win just compensation. “I was coming back from a doctor's visit and . . . then all of a sudden I look up and I see this big truck coming at me across the lane . . . I [looked] to see if there was anything I could do to get out of the way. There wasn't. Check out other kind words from our clients on our Testimonials page. Distracted driving is on the rise. It has quickly become a leading cause of accidents involving 18-wheelers and other commercial trucks. Trucking companies that employ drivers who talk on the phone, text, play on social media, communicate with dispatch, and give in to other driving distractions are liable for their drivers’ negligence. Speeding. Merging unexpectedly. Tailgating. Braking too late. These and other driving errors can cause serious accidents, even when large trucks are not involved. When the driver of a tractor trailer makes an error, the results can be devastating. If you or your loved one’s accident was the result of truck driver error, we want to help you fight for maximum compensation. Drunk driving a major issue among truck drivers. Driving under the influence of medications and illegal drugs is also a major problem among truck drivers. We seek just compensation for victims who suffer devastating losses because of truck drivers who drink or take drugs and then get behind the wheel. Truck drivers do not always watch below for cyclists. As a result, numerous cyclists have been hit and killed in Boston and Cambridge. Truck drivers have a responsibility to pay attention and check their mirrors; truck companies must keep their equipment up to date. Federal regulations limit the number of hours that truck drivers can spend on the roads. Unfortunately, it is well documented that many, many truck drivers exceed the maximum hour restrictions. They often do so under pressure from their employers. Was the trucker who hit you violating the law or simply too tired to drive? We can help you fight for the compensation you deserve. From faulty brakes and retreads to unsecured truck loads, anything that goes wrong with a heavy truck has the potential to cause a very serious accident. We handle cases against truck manufacturers, repair shops, trucking companies, shipping companies, and all other parties that are responsible for putting dangerous and defective trucks on Massachusetts’s roads. $3.5 Million Settlement for Family After Fatal Truck AccidentOur firm represented the family of a 56-year-old motorcycle rider who was killed in an accident involving a waste disposal truck. The truck driver had a “Z” restriction on his license, which meant that he was prohibited from operating any vehicle not equipped with an ignition interlock device (IID). The truck did not have an IID. Our clients accepted a $3.5 million settlement offer after the second day of mediation. Our firm represented a senior citizen who suffered severe orthopedic injuries in an accident involving a tractor trailer. The truck struck our client’s car after crossing over the center line. Our investigation revealed evidence of a possible mechanical lock-up, and after mediation our client received and accepted a settlement offer of $3 million. Our firm represented a 51-year-old executive and his wife in a case involving a rear-end collision involving an 18-wheeler. The husband suffered devastating injuries, including a spinal fracture, a fractured eye socket, and fractured fingers and ribs. In addition to his inability to work (which resulted in declining revenues for his company), the husband’s injuries also resulted in erectile dysfunction. Our clients accepted a $2.5 million settlement approximately one month after mediation. Our client’s car was side-swiped by an out of state trucker who fled the scene. Fortunately, the truck was pulled over less than a mile from the crash. Initially, our 25 year old client did not think he was hurt. Later that day he went to an emergency room where he was diagnosed with a back strain. He did not see another doctor for 6 months. Eventually, he returned to treatment after he was diagnosed with a herniated lumbar disc. A year later he underwent a spinal fusion. Due to our aggressive representation, we were able to prove that the back injury was due to the truck crash, and the case settled at mediation after a digital presentation of the evidence. Our firm represented a 33-year-old male who suffered multiple fractures in a broadside accident involving a delivery truck from out of town. During our investigation, we spoke to several witnesses who all saw the truck driver run a red light just before the collision happened. Our client suffered permanent disabilities as a result of the accident, though he was eventually able to return to work. We successfully resolved the case for $575,000. After a truck accident, it is important to start a thorough investigation as soon as possible. Evidence needs to be collected at the scene. Expert mechanical inspections may be required. You’ll need to get driver logs, shipping manifests, and other forms of documentation. If you wait or hesitate, those necessary documents may be lost or destroyed before you realize you need them. Witnesses need to be identified, and you need to make sure you receive professional medical care linking your injuries to the accident. Sometimes it is essential to start a lawsuit immediately. We may ask the court to issue orders to preserve evidence and to allow expert inspection. When needed, we hire accident reconstruction expert, engineers, and other experts to analyze the evidence. Prompt investigation and preservation of evidence are often the keys to a successful case. What if it has already been days, weeks, or months since the collision? If this is the case, that’s ok. We can still help you. Our truck accident attorneys and staff members will work as diligently as possible to collect the evidence needed to help you recover just compensation. The best thing you can do is to call us as soon as possible so that we can advise you and fight the fight on your behalf. We understand that you may have reservations about hiring an attorney, and we know that the last thing you want is to end up in a court battle that takes your time and attention away from your physical and emotional recovery. We want you to know that this is normal. We understand your situation – we have been there thousands of times before – and our pledge is to keep you fully informed while interfering with your life as little as possible. You take care of your recovery from the accident, we’ll take care of the recovery for your damages. Uncompromising client service from a team that has your best interests in mind. Strategic and aggressive representation from respected and award-winning trial lawyers. A commitment to success that means you do not pay anything unless we win your case. If you are ready to discuss your truck accident claim, contact Breakstone, White & Gluck, P.C. to schedule your free, no-obligation initial consultation. If you can’t come to us, we will gladly come to you. We are here for you 24/7, so call (800) 379-1244, start a Live Chat, or tell us about your case online now.